Brimming with honesty, humor, and zeal, Kendall Hale’s memoir shares her remarkable journey from youthful adolescence to thoughtful maturity in Radical Passions. Hale explores her early college years protesting the Vietnam War, her young adulthood struggles in Boston with a feminist band, the new communist and labor movements, and her transition to marriage and family. She takes us on her search for the socialist dream in Castro’s Cuba, Mao’s China, and Nicaragua during the Contra War, to her life as a wife, mother, and veteran of a fractured marriage. Therapy, Buddhism, and spiritual travels in India, South America, and the Pacific lead Hale to Asheville, North Carolina, a community replete with New Age dreamers, voracious developers, community gardens, Confederate flags, environmentalists, gun lovers, musicians and artists. Transitioning the second half of life, Hale faces the challenges of aging and its potential flowering of wisdom and integration. A story for all who seek deeper meaning in their lives, Radical Passions is the inspiring tale of an ordinary woman’s extraordinary life. 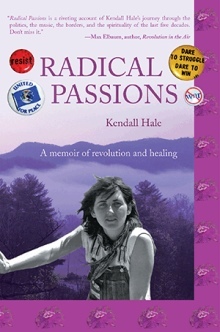 “Radical Passions” is a riveting account of Kendall Hale’s journey through the politics, the music, the borders, and the spirituality of the last five decades. The author takes you right along with her as she protests on the barricades during the tumultuous 1960s, works in a shipyard with 5,000 men in the 1970s, builds a health clinic in Nicaragua in the 1980s, turns 50 in Peru in 2000, and searches for inner peace and balance every step of the way. These pages reveal how Kendall did indeed fulfill her destiny as a seeker/warrior- and to the reader’s good fortune is now a writer as well. Don’t miss it. I want to give tribute to the collective of writers that preceded and inspired my memoir. I would not have written my book without them. We co-authored WRITTEN OUT of HISTORY: memoirs of ordinary activists by Bette Steinmuller, Nancy Teel, Beatrice Nave, Linda Stern, Steven Norris & Kendall Hale. Available on Amazon.